Believe it or not, it's not that hard for homeschoolers to find opportunities to socialize and learn healthy socialization skills! 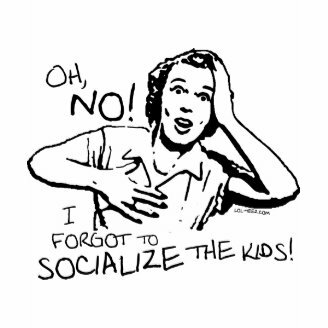 Homeschooling Socialization: Gotta Get Me Some of That! This page is NOT for homeschoolers! If you don't homeschool, you probably wonder how homeschooled children can possibly "get socialized." If you're thinking about homeschooling, you're probably wondering how you will make sure your children will "get socialized." If you are a homeschool veteran of any length of time, then you're probably wondering how to find time in between social activities to squeeze in some lessons. So, this page is really not for homeschoolers, at least not if they've been homeschooling for a while. It is to address the question "but what about socialization" so often asked by the non-homeschooler and those who are hoping to homeschool. And veteran homeschoolers may even find it useful for placating the grandparents. What is socialization, and what is homeschool socialization? Let's start with some definitions. 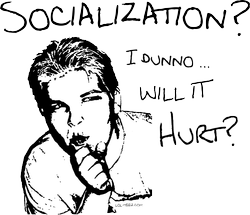 Socialization, according to Dictionary.com, is a continuing process whereby an individual acquires a personal identity and learns the norms, values, behavior, and social skills appropriate to his or her social position. To socialize, according to the same source, is to make social; make fit for life in companionship with others. And social itself is pertaining to, devoted to, or characterized by friendly companionship or relations (a social club); also seeking or enjoying the companionship of others; friendly; sociable; gregarious. So by homeschooling socialization, we mean making sure our homeschooled kids are fit to mix with people at home and at work, whether they attended public school or homeschool, and will become beneficial contributors to the fabric of society. Homeschool socialization is easy with a homeschool support group! If you can't find what you're looking for, then start one! If you cannot find a homeschooling group in your area, or at least one that is a good fit for your family, then start one! Start somewhere that most homeschoolers go: the library! Ask the librarians if they know any homeschooling families. Even if they don't, get permission to post notices about your new startup homeschool group. Don't forget the internet! Check Yahoo groups for other groups in your area. Ask them if you can mention your startup group on their list. Some may not allow it, but others probably will, especially if your group is very different from theirs (for instance, if they are a teaching co-op, and you want to start a play group). Other places to advertise are community newsletters, local bulletin boards, and even a press release to the local newspaper or community cable channel! Think about what you want before you start advertising. Are you just looking for homeschooling socialization time? Then find a post the location of a pleasant park and meet your new friends there. Are you looking for a teaching co-op? Specify in your notice what subjects and age range you are looking for. Do you want a book club? A chess club? A Toastmasters club? A group to go on field trips with? A little of everything? Put your ideas on your notice and wait to meet your new friends. One other important consideration is whether your group will be Christian, secular, or inclusive. Most groups are strongly Christian or secular, but inclusive groups can be very warm and welcoming places. If you're not sure what you want, find a couple of other homeschool families who want to help start a new group and start talking. You'll figure out what everyone wants and how to implement it together. Most communities offer many and varied opportunities for homeschool kids to get out of the house and socialize! Whether a day camp or overnight camp, homeschool kids will have plenty of opportunity for education and socializing at summer camp. Summertime is an especially fruitful time for finding homeschool socialization opportunities at specialty classes. In larger cities, one- or two-week summer camps offer both learning and social opportunities. Check at community colleges, science centers, zoos, community centers, the YMCA, churches, and museums for day camps for preschoolers to teens, as well as many other commercial venues that offer ways to entertain and educate kids throughout the summer. Find SUMMER CAMPS by zip code! There is an almost endless list of possibilities for honing socialization skills when a group of homeschooled kids gets together! There is no way I can even begin to make a comprehensive list of the ways homeschooled kids can socialize together. Lacking the inhibiting factors that are learned so quickly in institutional schools' "Lord of the Flies" atmosphere, and with a sturdier sense of assurance in their own curiosity and ability to entertain themselves than kids who are rarely allowed time to consider what they might really be interested in, homeschooled kids are almost infinitely creative in coming up with ways to interact. Here are just a few that my own kids and their friends in our small homeschool support group have enjoyed over the years. * far too many other activities to mention! See Homeschooled Kids Practicing Social Skills in Action! A bunch of homeschooled kids (mine among them) wrote and filmed this spoof of The Matrix movies. They are aged 4 to 17 and all had a hand in the story writing. Socialization is something that happens naturally and uniquely for each homeschooling family. We live in a big city with many opportunities for classes and ways to connect with homeschooled and public schooled kids. I know a family in Los Angeles whose homeschool group meets in Disneyland! In a more rural area you might find outdoor activities more beneficial to your family's homeschool socialization efforts. The point is, you can and will find ways to get out and meet people. Keep an open mind and you'll see opportunities everywhere. And remember, while friends close in age are sometimes nice, there is no peer pressure on homeschooled kids to sensitize them so that they feel they must ignore or even bully children who weren't born within eight months of their own birthday. One of my favorite homeschool moments was when an elderly couple approached me and a couple of other moms in our group when we were at the park one day. They stated that they walked there often, and had been so impressed by the interaction of the kids in our group that they stopped to watch, just for the pleasure of seeing the older kids welcome the younger ones into their games, and no one pushing or competing for the slide or other desirable playground activity. Their compliments toward our children went far toward strengthening my belief that I don't have to worry about socialization ... because I homeschool them. "Once upon a time, all children were homeschooled ..." Rachel Gathercole, a ten-year veteran of homeschooling, thoroughly refutes the common misconceptions surrounding socialization and homeschooling. 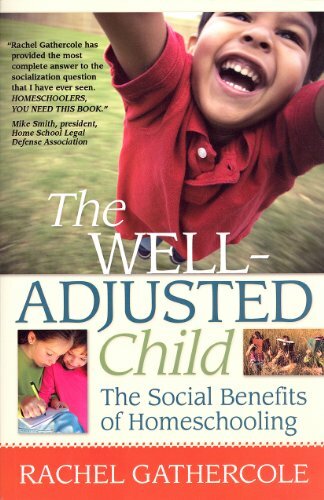 More About Homeschooling and Socialization! This article is one of a series on homeschoolers and socialization skills. 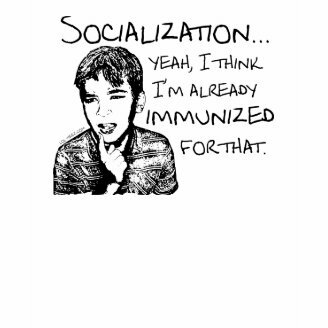 Homeschooling and Socialization Go Together Like T-shirts and Torsos! 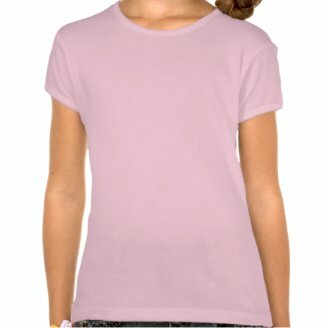 A collection of the very best sassy answers to the "S" question on t-shirts, hats, hoodies, and more gear for homeschoolers! All images copyright © tandemonimom. All rights reserved. A learn-to-read club is lots of fun for preschoolers and early elementary homeschoolers! There are many field trip learning opportunities for high school homeschoolers besides the traditional ones. You'll want a yearbook to commemorate all these great homeschool socializing opportunities! Homeschool Socialization: Did I Give You Any Good Ideas? Did I Miss Any Cool Ones? This is brilliant....I must forward this to my mother who isn't too sure about the idea. I intend on adopting in the next couple of years and I am completely leaning toward homeschooling. Great informative article. Thanks! Jimmie, excellent point! It is more a parenting issue than a schooling issue. A parent can do a lot to isolate a child even in public schools, and a homeschooled child can have more social interactions than a public schooled child. The lovely thing is, the amount of homeschooling socialization opportunities can be made to fit the family, instead of each kid being shoe-horned into the exact same social "opportunities" whether helpful to a particular child or not. Another excellent resource. I know you stated at the beginning that this page really isn't for homeschoolers, but I have do disagree. It is so comprehensive that I am sure any homeschool family will come upon some ideas they hadn't thought of, even if we are not worried about socialization. My kids participated in many of the activities you mention above. I was a den mother and we had a Cub Scout group with two homeschoolers and the rest public schoolers, so we didn't isolate ourselves there, either, and it worked out very well. Sports teams are great socializers. Our favorite was probably our homeschool co-op group's classes. We did fit studying in when we could! Ron, actually the opposite is true. 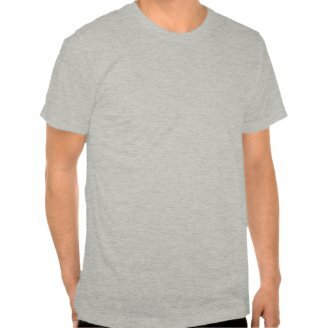 As an introvert in public schools, forced into interactions whether I wanted them or not, I withdrew into extreme shyness that I was unable to overcome until my adult years. Three of my four children are introverts like me, but they have a wide and varied circle of friends. Since they have as much "down time" as they need, they therefore do not feel the need to retreat to protect their privacy they way I did. What a great treatment of the issue. Or should I say non-issue. 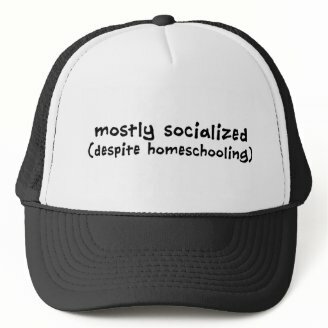 Most homeschoolers I know are better at healthy socialization than their public schooled peers. Healthy is the key word. But, of course, homeschooling is not a magic pill. The bottom line is parenting, being deliberate about what your children are exposed to and involved in. At the highway dept last week, standing in line, I watched as two little 3-4 year olds became fast friends. Children do naturally migrate toward each other - and they were a perfect example. Your ideas and activity lists are going to be so helpful and reassuring to new homeschooling moms who are hesitant about reaching out! Dianne - a thorough discussion of homeschool socialization options. It makes you realize that we take socialization for granted but it would be very easy for homeschooled children who are introverted to be isolated from their local peers. 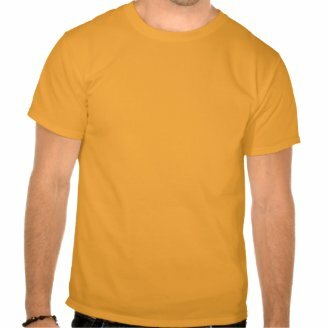 I loved the TShirts. Dianne, I have never met a homeschooled kid who fits the stereotype of awkward and unable to socialize. Of course there are shy homeschooled kids (just as there are shy public schooled kids) but still overall they are good kids who don't have trouble fitting in! How can homeschooled kids NOT become socialized?! 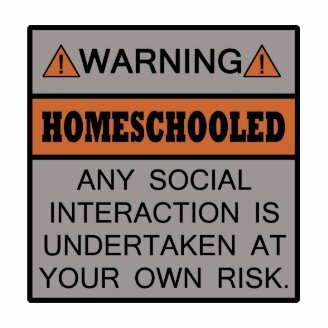 Most homeschooled kids I know are very social and all around great kids!